My loyal fans might remember that back in July I mentioned on my wonderful blog here http://blog.thecatsdiary.com the NASA Face In Space Program which those amazing people at NASA and this peerless genius of a Cat had created so that you can send a picture of your extremely good self (and or a friend) into Earth orbit on board that wonderful thing called the Space Shuttle. 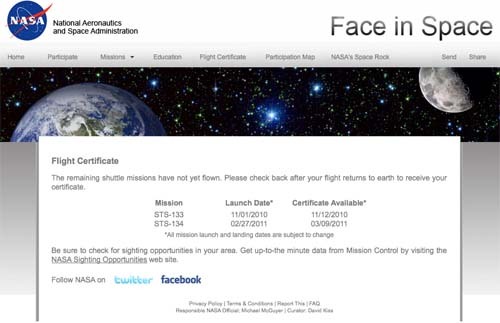 Well just to give you an up date the https://faceinspace.nasa.gov/index.aspx launch dates have been updated and can be viewed either below or by clicking this pretty blue link which will whisk you at the speed of either sound or light (depending upon your internet connection) or looking at the copy of the page that you will be whisked to below. Of course this means that you still have time to join in and get your https://faceinspace.nasa.gov/index.aspx place if you see what I mean! I really do recommend that you join in because this is probably the last opportunity to get into space safely for us ordinary folk, you could always take a chance on the Virgin Space Plane if you have hundreds of thousands of dollars spare and any faith what so ever in the blond Richard Branson’s efforts. But frankly you only have to look at his F1 Team Virgin Racing to see just how well Virgin build anything that is supposed to be beautifully designed sleek and fast. Mind you the poor 3-legged Virgin Racing team came into the F1 Racing series like a lion, with press releases, TV appearances, trumpets, fireworks, dozens of partly clad young ladies (who may or may not have lived up to the brand name) and so much more, with the blond beardy fella shouting his mouth off on radio and TV about how he was going take the established teams on and beat them at their own game but at the same time spend less money (billionaires don’t tend to like dipping into their pockets of course). If finishing last or nearly last if they finish at all in F1 races is what the ‘established’ teams have been doing all these years the blond beardy one has succeeded and must be congratulated but this Cat is not a moron and tends to think that Virgin and Hi Tech don’t go together, maybe Virgin should stick to Spas and phones – oh sorry I forgot those endeavours have been sold off. All of which suggests to this wary Cat that the best place for the $50-100 grand needed for a few minutes in space is better kept in your bank, surely it is safer to read all about the possible failure of the Virgin Space Plane than to be part of it!